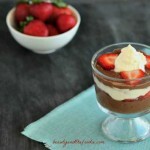 Paleo Chocolate Strawberry Parfaits are paleo, gluten free and have low carb and dairy free options. Delicious layers of creamy chocolate pudding, whipped cream, and berries. Place 3 tbsp cold water in a small bowl and sprinkle 1 tbsp unflavored gelatin over the water and whisk thoroughly with a small whisk or fork until all gelatin is dissolved and lump free. Set aside. In a medium sauce pan over medium heat combine: 1 ½ cup coconut milk or heavy cream, 1 beaten egg yolk, 3 tbsp cocoa powder, 1/3 cup sweetener of choice, 2 tbsp coconut oil, and ½ tsp vanilla extract. Use a whisk to vigorously whisk all ingredients together while heating. Continuously whisk until very smooth and lump free. Turn heat down to simmer and spoon in all the gelatin water mixture. Whisk the gelatin in while simmering. Whisk thoroughly to make sure all gelatin in mixed in and lump free. Once completely smooth and combined, remove from heat and cool. Once cooled, pour into one large container, then cover and refrigerate for 4 hours or until pudding is set. Once pudding is set, remove from fridge and stir a little. Divide pudding into four equal servings. Spoon a small amount of pudding into the bottom of four small (2 to 3 ounce) parfait or other type of containers. Mix either coconut cream or whipped heavy cream with sweetener of choice. Add a thin layer on top of each chocolate pudding layer. Layer some sliced strawberries on whipped topping layer. Then layer with a little more pudding. Top with a few strawberry slices and a small dollop of whipped topping.